With the vote only a few days away on 18th September, campaigning on both sides has been stepped up. Campaigners have been engaging with the people to present the facts to them in a logical and professional manner. 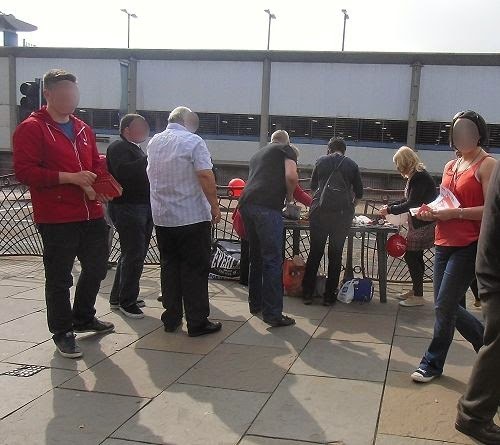 For the benefit of visitors from outside Scotland, it is good to give them an idea of how campaigning is being conducted on the streets of Scotland. While in a town centre, I watched the two sides campaigning. The two sides are the 'Better Together' campaigning for the Union and the 'Yes Scotland' campaign supporting an Independent Scotland. Below are some images from the campaign. 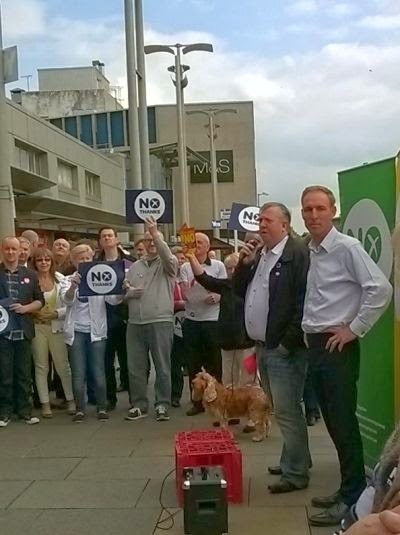 The Better Together campaigners in the streets. The faces are blanked out, as the woman on the right became aggressive at the photograph being taken. The Better Together campaigners had Labour MP's Jim Murphy and Michael McMahon speaking in favour of retaining the Union. 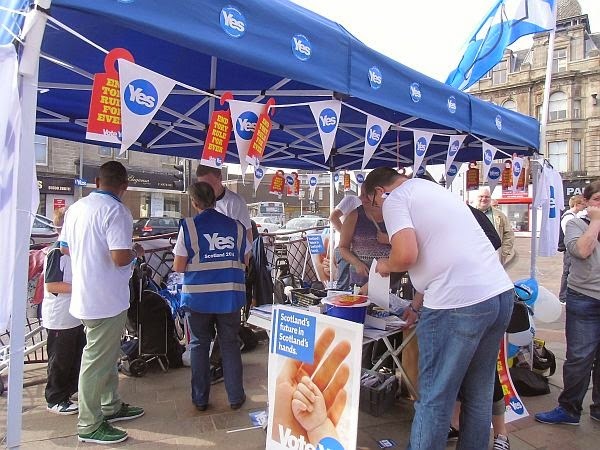 The 'Yes Scotland' campaigners had a more colourful presence in the street and attracted a lot of attention. The correct blue for the Saltire (Scottish flag) is a sky blue colour (Pantone 300 or #0065BD as hexadecimal web colours) and not the dark blue found on the Union Flag. MP Jimmy Hood is the Labour MP for the area. 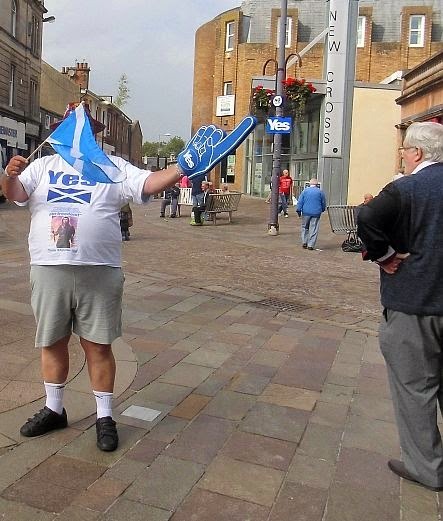 The above picture shows a 'Yes Scotland' supporter greeting him. Member of the Scottish parliament, Christina McKelvie was also present to speak to the voters and pose for photographs with them. 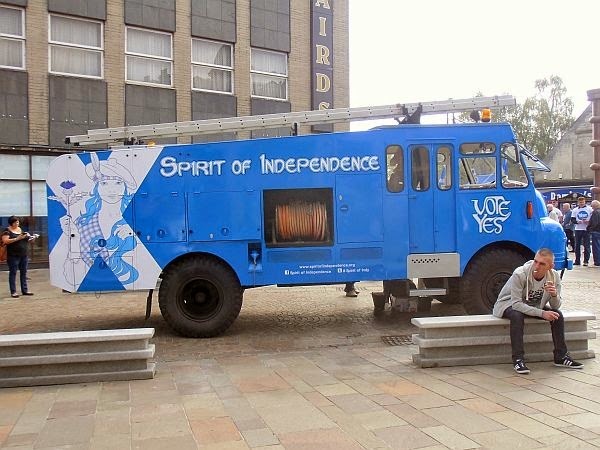 The 'Yes Scotland' campaigners have been touring the country with a blue fire engine. The outcome will be known after 18th September.